The Jack M Barrack Hebrew Academy will have an open house and host the IAC. The Israeli American Council’s Eitanim program is a unique leadership and entrepreneurship project-based program for high school students, 9th-12th grade. IAC Eitanim allows the students to connect, explore, and experience Israel while preparing for college and developing professional skills.The program develops students’ creativity, self-learning skills, team-work skills, and a connection to Israel through real world challenges, while working with experts on creative ideas and innovative solutions and technologies. Introductory meeting: Thursday 10/27 @ 6:00 p.m. – 9:00 p.m.
First three sessions: 11/7, 12/18, 1/12 @ 6:00 p.m. – 9:00 p.m.
Second three sessions: 2/9, 3/16, 4/20 @ 6:00 p.m. – 9:00 p.m.
Third three sessions: 5/11, 6/1, 6/[email protected] 6:00 p.m. – 9:00 p.m. The Israeli-American Council (IAC) has partnered with the successful Taglit Birthright Israel program to launch a special Hebrew track called IAC Shelanu. Taglit-Birthright Israel participants. Photo by Luqux. The new program offers a 10-day trip to Israel designed specifically for Israeli-American young adults, ages 18-26. IAC Shelanu, in partnership with Taglit Birthright Israel and Israel Experience, will be conducted in Hebrew, aiming to engage this unique group of young leaders and create future Jewish-Israeli community influencers. Registration opens September 9 for the December 2014 program. According to a recent study commissioned by IAC and conducted by leading Israeli polling company Midgam, about 17% of second generation Israeli-Americans are married to non-Jews and Hebrew fluency drops from 53% to 19% for those living in the U.S. more than ten years. IAC Shelanu aims to provide an authentic Israel experience that will help these young Israeli-Americans and other Hebrew speakers to connect on a deeper level with their Jewish-Israeli identity and expand their knowledge of and acquaintance with the State of Israel, its history and culture. IAC Shelanu provides the experience of a lifetime for its participants, including a recruitment process by the IAC that focuses on identifying, selecting, and encouraging potential leaders. IAC Shelanu will then follow up with participants upon their return to ensure an enduring impact on their lives and further involvement in pro-Israel advocacy. Participants will be encouraged to participate in an IAC Shelanu alumni program, which will develop their connections to one another and the State of Israel while fortifying them with the network and skills needed to be ambassadors for Israel. More information about IAC Shelanu can be found at its website. The iconic Israeli folk singer and comedian Arik Einstein passed away suddenly at the age of 74. Einstein introduced entire genres, including rock, to Israeli music. Imagining Israeli music without him is like imagining the NBA without Michael Jordan. He will be missed. More praise for this Israel entertainment legend and videos of his music and comedy follow the jump. We are sad to hear about Arik Einstein’s death and send our condolences to his family, friends, fans, and to all Israelis. Einstein is an Israeli cultural legend and probably the greatest Israeli singer of all time, and we’re sure that every Israeli who lives in the U.S. today shares in the sadness of his passing. A major icon of Israeli culture has left us, but his memory and songs will stay with us forever. Why Does The United States Persist In Funding UNWRA? The Israel Advocacy Committee of Temple Beth Hillel-Beth El sponsored a program with Israeli investigative journalist and former Philadelphian David Bedein, who for the past nine years has been sounding the alarm that the US has been funding an anti-Israel, anti-Semitic and anti-American educational curriculum in UN-run Palestinian refugee camps. Bedein and his colleague Dr. Arnon Groiss presented to an audience of 50 the same program they had presented to U.S. Congress staff and committee members earlier that week, including a film showing the horrendous pervasive misstatements in textbooks provided by $250 million of US yearly funding to 500,000 students. There is apparently no oversight regarding these funds to UNWRA. Thus, we are funding a curriculum of violence, terrorism, jihad, and war. This is directly counter to any possible, reasonable attempt at a peaceful resolution of the Arab-Israeli conflict. A generation of children are being brainwashed and poisoned. Bedein said however that his work is finally bearing fruit: Congressman Chris Smith (R-NJ) will be holding hearings. And he encouraged us all to contact Sen. Bob Casey especially, who is chairman of the senate subcommittee pertaining to the Middle East to hold similar hearings. Clearly, it is incumbent upon us to contact our legislators and get them on-board; it is hard to imagine that they want US taxpayers to be complicit in this sham. Dr. Arnon Groiss, David Bedein and Lee Bender. Photo: Richard Chaitt. folks who produced the film Crossing the Line: The Intifada Comes to Campus) called Step Up for Israel. The first film, which we will be showing on Sept 25 is entitled, Creation of a State. This is very timely, given what is happening in the United Nations this week. This course will be very informative, professional and educational. Please come and bring your friends. Cost is only $5.00 and includes bagels and coffee. The next program, entitled, “Israel and the West” will be presented on Sunday October 30. Two of the most malignant lies promulgated about Israel and the Jewish people are the invectives “occupier” and “colonialist.” Separately and in tandem, our enemies use them as weapons to delegitimize us. But one local man, fed up with the anti-Jewish mythology, has written the verbal equivalent of a sledgehammer to smash these attacks. 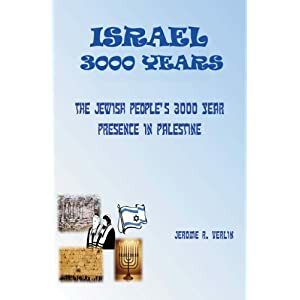 Author Jerome R. Verlin’s Israel 3000: The Jewish People’s 3000 Year Presence in Palestine is now in its second edition, and Verlin discussed the book‘s key points at a recent Temple Beth Hillel/Beth El Israel Advocacy Group breakfast. Both Israel’s enemies and those ignorant of the facts claim that Jews have been in the land for a mere 63 years — since David Ben-Gurion read Israel’s Declaration of Independence. Others use 1897 — the year of First Zionist Congress in Basel, Switzerland — as the purported beginning point of the Jewish presence in Eretz Yisrael to depict the Jews as an ersatz indigenous people. Then there are those who acknowledge that Jews began living in the land more than 3,000 years ago but were exiled and claim Jews were devoid from the area following the Roman conquest. But Verlin, using historical, archaeological, and other data, plus the conclusions of noted past experts and observations of travelers to the Holy Land, to document that yes, Jews began living in the territory thousands of years ago, and despite the slaughters, name permutations and repeated conquests, Jews have consistently and continuously lived in Israel. Yet figures from President Jimmy Carter and Mahmoud Abbas to The New York Times ignore all of the evidence, according to Verlin, to erase or weaken the legitimate Jewish claim to the land. Verlin went through the history of the settlement of the land from the biblical period to today, explaining the many times control of the region changed hands from the Jews, Babylonians, Persians, Jews, Romans, Greeks and Byzantines, various Middle Eastern groups, crusaders, more Arabs and Turks, the British and finally the Jewish People. All along the way he documented that through it all, Jews were the lone constant. Meanwhile, there is no evidence to support the claims that the land belonged to the Palestinian-Arabs or that the Muslims pre-dated the Jewish presence there. Also, the people who today call themselves “Palestinians” are not related at all to those Middle Eastern peoples who had temporary sway over the region in different periods, Verlin said. Therefore, previous or theoretical land concessions Israel or the Jewish people have made or will be asked to make should never be referred to as “giving back” territory, he stressed. “Jews” and or “Judea” or “Israel” turn up in artifacts, the Bible, accounts of wars, chronicles of pilgrims and official records and censuses. Verlin offered numerous examples that none but the irrational could dispute in their totality. Further, since the mid-19th Century, Verlin noted, Jews once again were the majority in our holiest city: Jerusalem. “We have to make the case to the world,” Verlin stressed, because our adversaries would like public opinion to shift away from the Jews and Israel in favor of the false Arab and Muslim narratives. If most people viewed the Jews as interlopers or a people who have displaced the native “Palestinians,” it would endanger Israel’s very existence and give credence to Arab and Muslim claims that Jews stole “their” land or that Israel was “created” only as a refuge for Holocaust survivors. It might be awkward for Israel’s advocates to walk around with sledgehammers, but Verlin’s paperback will go a long way in countering the libels and slanders that we are the new kids on the Middle Eastern block.